To provide the highest quality of legal services with uncompromising integrity and uncommon value. 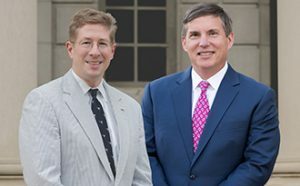 Since then, Murphy & Grantland has grown from two attorneys, a paralegal, and a receptionist to 20 attorneys and a full-fledged legal and office support staff. After outgrowing three different office locations, Murphy & Grantland built its present location at 4406-B Forest Drive in Columbia in 2005, where it is positioned to serve all of South Carolina from this central location in the Capitol City. A firm is only as good as its people, and Murphy & Grantland has been fortunate to assemble a team of quality lawyers and staff dedicated to providing exceptional representation to our clients. Our attorneys offer a diversity of legal experience with experience in a variety of practice areas. Despite the success of the firm and its rapid growth in recent years, each attorney remains committed to Murphy & Grantland’s central mission, and we strive to serve every client in light of our five core values: Integrity, Quality, Diligence, Service, and Efficiency. The firm now represents a number of clients including Nationwide, Zurich America Insurance Company, USAA, The Hartford, Progressive, GEICO, Grange Mutual, Acceptance Insurance, and Southern Mutual Church Insurance Co., as well as many other insurance companies and self-insured businesses.